The first Holiday Folk Fair took place at the Wisconsin Electric PUBLIC SERVICE BUILDING on December 10, 1944. It was modeled after a number of events, including a similar fair held in Chicago. Despite a snowstorm and the Second World War, over 3,000 people attended. 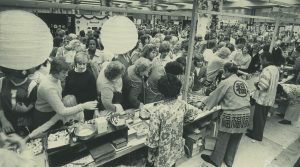 Because the fair has continued to grow by attracting more visitors and vendors each year, the Folk Fair has been held in numerous locations, including the MILWAUKEE EXPOSITION CONVENTION CENTER AND ARENA (MECCA) and the SUMMERFEST grounds. Since 1999 it has been held at the WISCONSIN STATE FAIR grounds. 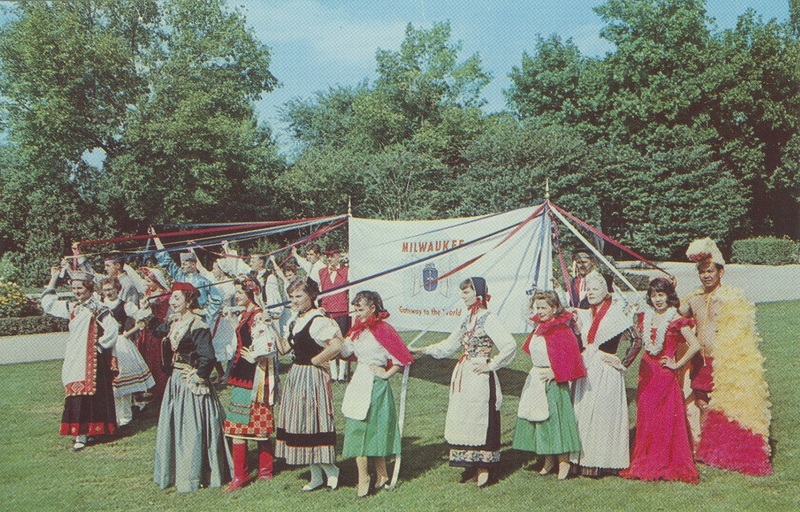 The first Folk Fair lasted one day and presented fourteen nationalities. The highlights of this fair were a cookbook, of which 2,000 copies were sold, and a program that one observer (probably unfairly) dismissed as “little more than a parade of costumed participants around the hall.” Although the Folk Fair’s mission has remained the same, it has grown much larger over the years. In 2013, a crowd commonly estimated as fifty thousand attended the three-day day event and enjoyed music, dance, costumes, food, crafts, and performances from fifty-three ethnic groups. ^ Edith H. Quade, “Milwaukee’s Holiday Folk Fair,” LORE 4 (1954): 103. ^ Quade, “Milwaukee’s Holiday Folk Fair”: 102.; Nick Carter, “A New Home For the Holidays,” Milwaukee Journal Sentinel, November 18, 1999, accessed July 29, 2014. ^ Quade, “Milwaukee’s Holiday Folk Fair”: 102, 105; Bea Pepan, “Holiday Folk Fair Started Small 30 Years Ago,” Milwaukee Journal, November 19, 1974, accessed July 29, 2014. ^ Quade, “Milwaukee’s Holiday Folk Fair”: 104. ^ “Holiday Folk Fair International,” International Institute of Wisconsin, accessed July 29, 2014. ^ “Ethnic Groups,” International Institute of Wisconsin, accessed July 29, 2014; “Events,” International Institute of Wisconsin, accessed July 29, 2014; Heather Ronaldson, “Holiday Folk Fair a Smorgasbord of Cultures,” Milwaukee Journal Sentinel, November 15, 2013, accessed August 8, 2014.
International Institute of Wisconsin. “Holiday Folk Fair International.” Accessed July 29, 2014. Quade, Edith H. “Milwaukee’s Holiday Folk Fair.” LORE 4, no. 4 (Fall, 1954): 102-107.